The Rosy-faced Lovebird (Agapornis roseicollis) is a small, colorful parrot which is a popular cage bird in the U.S. and elsewhere. Since at least the mid-1980s, feral flocks of this species have been reported breeding in residential neighborhoods of the greater Phoenix area. Most exotic species that escape do not survive long in the wild and fewer still establish breeding populations in non-native habitats. However during the past 25 years, populations of these lovebirds have increased and expanded and they have become regular city park and backyard visitors to many greater Phoenix neighborhoods. Figure 1: Rosy-faced Lovebirds (20 September 2008) at Gilbert Water Ranch. Formerly known as Peach-faced, this lovebird is native to dry wooded country in southwestern Africa, up to an elevation of 1500 m (Collar 1997). Its natural range is poorly known, but the species is generally found in Angola, southward along the coast through Namibia to Northern Cape Province, South Africa (Juniper and Parr 1998). It is fond of arid regions but depends on areas near water, and exhibits nomadic tendencies where water is scarce or unavailable. In Africa this lovebird is found in scrubby hillsides and tree-lined watercourses including river canyons and in rocky terrain where area rainfall exceeds 100 mm (Collar 1997). It is a colonial breeder with natural breeding sites in inaccessible and often vertical cracks in sandstone koppies— small usually rocky hills rising up from the African grasslands—or steep rock faces on exfoliating granite (Simmons 1997). However, it is highly adaptable and also nests and roosts in Sociable Weaver (Philetairus socius) nests, as well as in artificial structures and junction boxes on power poles, and in other unnatural habitats (Simmons 1997). The wild population status of the Rosy-faced Lovebird is not exactly known. However, Simmons (1997) indicated that it is unlikely that any range contraction has occurred during the 20th century, and that it is more likely that populations have increased with the provision of water points in previously dry areas, and of artificial structures in which it can nest. Simmons believes that the species is widespread and abundant in the wild. Captive birds have escaped in urban areas of South Africa but have not become established (Collar 1997). The Rosy-faced Lovebird is widely bred in captivity both as a hobby and commercially for the pet trade. Only three of more than 500,000 individuals exported from 1992 through 2001 were of wild origin (CITES 2004). It breeds easily in captivity. A pair can potentially rear three broods (4-5 eggs per clutch) in a season (Vriends 1984). As a consequence of their popularity and ease of captive breeding, local escapees and illegal releases from breeders and owners are likely the initial source of a widespread and conspicuous feral lovebird population now found in the greater Phoenix area. The Rosy-faced Lovebird population in Phoenix is the only known feral population in the United States. Small groups have been observed outside of the greater Phoenix area in Arizona, such as in Tucson, but little has been documented about those sightings and there is little evidence suggesting that these areas have established colonies. Interestingly, the Arizona population of Rosy-faced Lovebird is one of the very few populations of introduced parrots that descend from domesticated stock (R. Jonker pers. comm.). 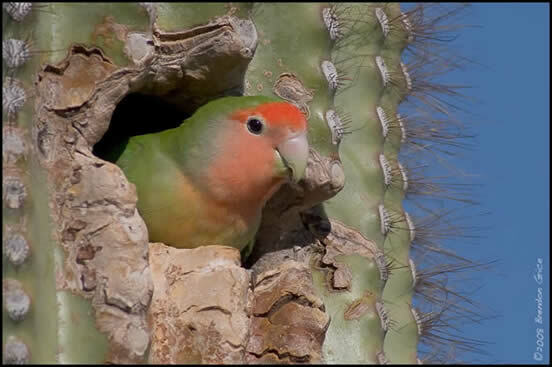 The Rosy-faced Lovebird was first reported as breeding in the greater Phoenix area in a residential neighborhood in the East Valley near the Apache Junction and Mesa city border in 1987 (Michael A. Moore pers. comm.). Moore also noted successful nesting in 1988 and he observed flocks continuously in this area until he moved from the neighborhood in 1995. From their first detection of nesting in 1987, the population had greatly expanded by the end of the Arizona Breeding Bird Atlas project (1993-2000). In the mid-1990s colonies and flocks were noted in several eastern greater Phoenix area neighborhoods and by 2000 lovebirds had been detected on ten residential atlas blocks encompassing approximately 100 square miles from northwest Phoenix and north Scottsdale south to Tempe and Guadalupe and then west to Apache Junction (Corman 2005). This evidence strongly suggests the continued presence and breeding of lovebirds in the greater Phoenix area for 20+ years. 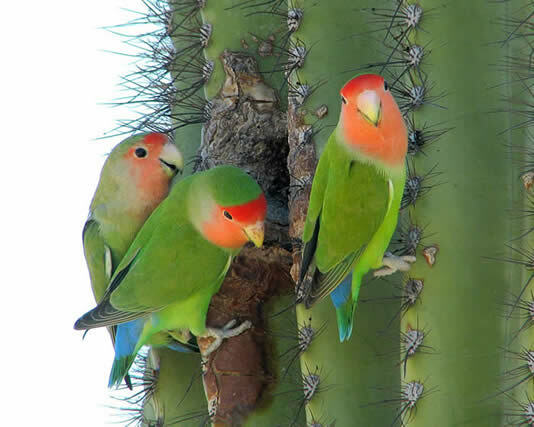 Further documentation of nesting of Rosy-faced Lovebirds was published in the Arizona Breeding Bird Atlas (Corman 2005). According to atlasers, nesting activity is generally initiated in April or May and eggs are likely laid from April-June, but nesting may occur irregularly throughout the year, a seasonal pattern similar to that observed in the species’ native African habitat (Forshaw 1977). In Arizona adults have been observed carrying nesting material (strips of vegetation tucked among tail feathers) as early as late February. The most commonly reported nesting (and roosting) sites for lovebirds in the greater Phoenix metro area are under the dead fronds of untrimmed palm trees, especially Canary Island date palm (Phoenix canariensis), and shallow cavities in saguaros (Carnegiea gigantea), with fewer reports among house roof tiles (Corman 2005). Breeding Bird Atlas surveyors found the majority of lovebirds in residential neighborhoods, with vegetation ranging from primarily exotic shrubs and trees to a mixture of some native species, including mesquite (Prosopis sp), palo verde (Parkinsonia sp), and saguaro (Corman 2005). These exotic birds are most abundant in older established neighborhoods where there are many tall shade trees and palms (Corman 2005). Lovebirds are regular visitors to many backyard water and feeding stations, but they also regularly feed on fruit and seeds of native and exotic plants, e.g., cactus fruit, apples, palm fruit, and various seed pods including those from common desert landscaping plants such as mesquite, palo verde, and mimosa (Mimosa sp). Rosy-faced Lovebirds are common and widespread in the greater Phoenix area, but little has been formally documented about population size and distribution. To establish a quantitative baseline understanding of the population, a coordinated census was conducted on 27 February 2010 by the Arizona Field Ornithologists (AZFO). Light Blue = 1-5 birds, Red = 6-10 birds, Dark Blue = 11-20 birds, Green = 21-50 birds. The area censused (Figure 1) extended from west Phoenix, north to Scottsdale and Hwy. Creek, an area roughly 24 miles in diameter. Sixty-one census teams, with one to five censusers each, canvassed residential and urban areas for several hours from dawn until approximately 2:00 pm. Each team was assigned a specific area, but areas varied in size from a single backyard to a neighborhood. To minimize overlap or double counting each area was discrete with little to no common boundaries. However, some overlap may be inevitable with fast flying mobile lovebirds. Because of the massive greater Phoenix area size (450 square miles), censusers concentrated on areas of known occurrence. Even though participants often focused their surveys in known localities, many other areas where lovebirds are known to occur were not surveyed. Surveyors conducted the census on foot, bike, and/or while driving slowly through residential neighborhoods with vehicle windows down to listen for the distinctive high-pitched calls of the lovebirds. Survey totals were posted to the Arizona Field Ornithologists website at: http://azfo.org/PeachFacedData/ and the data exported to a spreadsheet (Table 1). The results of this half-day census were enlightening. A total of 948 Rosy-faced Lovebirds detected. This number far exceeded our predictions. Nearly half of the birds were detected within Phoenix city limits, with a combined total >300 also counted in Mesa and Scottsdale. Parts of the lovebird’s known range (e.g., NE. Apache Junction, Cave Creek, E. Gilbert, and NW Phoenix) were not surveyed and we estimate that less than 50 percent of suitable habitat in the greater Phoenix area was surveyed. Furthermore, lovebirds can be difficult to detect, for example when perched quietly in vegetation. Approximately a third of the census teams detected no lovebirds, even though some were surveying areas where these birds were detected within a few days to a week prior (Table 1). Based on these factors, we estimate the population of Rosy-faced Lovebirds in the greater Phoenix area to consist of at least 2500 individuals. Figure 2: Greater Phoenix Area map (reproduced from Mirror-Pole website) of reported Rosy-faced Lovebird locations in 1999-2005. Yellow balloons indicate sightings of 1-10 individuals and red balloons = flocks of >10 individuals. (Ndithia 2007), but more research is needed. Most of the range of the Rosy-faced Lovebird in the greater Phoenix area is outside boundaries of Christmas Bird Counts (CBCs) and little information is, therefore, available on the species’ population growth and distribution. Furthermore, the lovebirds have been largely ignored on CBCs where they do occur. Few birders or ornithologists have interest in conducting studies of exotic birds in urban or suburban areas (Pranty and Garrett 2003). Among biologists and birders is a propensity to ignore exotic birds. Almost no one wants to gather data regarding them; indeed, one sometimes hears cries, often delusional, to eradicate many exotics (Smith and Smith 1993). These unfounded and irrational cries of eradication still echo today regarding the lovebirds. In fact, a few census participants were reluctant to take part at first, and some lovebird enthusiasts refused to participate out of concern that the census data would be used to initiate an eradication effort. Rosy-faced Lovebird locality and population information has been compiled and mapped since 1999 by Greg Clark (http://mirror-pole.com/collpage/pf_loveb/pfl_1.htm). This web site uses Google maps technology, where observers map site location and include the date, numbers present, and other notes such as roost sites and nesting activity. The web site shows that populations have expanded during the past decade in all directions from original population centers (Figures 2 and 3), but it is difficult to determine the actual rate of growth and expansion entered on this website since 1999, as some of the increase in detections likely results from additional lovebird enthusiasts learning about the website and submitting information. 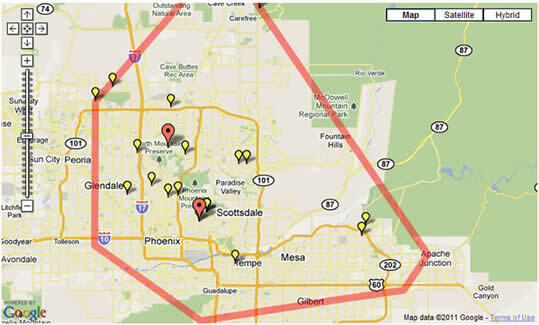 Figure 3: Greater Phoenix Area map (reproduced from Mirror-Pole website) of reported Rosy-faced Lovebird locations in 1999-2010. The red border shows the initial known boundary of the species. During the late 1980s, Moore regularly observed 6-9 lovebirds near the Apache Junction and Mesa city border (pers. comm.). In two separate years these birds were accompanied by young that had recently fledged from cavities in tall saguaros. Moore also noted that the time of fledging coincided with the fruiting of the saguaros and he observed adults feeding on saguaro fruit. Rosy-faced Lovebirds are probably opportunistic breeders like Budgerigars (Melopsittacus undulatus), starting a breeding cycle when conditions are optimal (R. Jonker pers. comm.). The current lovebird population is apparently self-sustaining and not entirely dependent on humans for food and shelter. Furthermore, Rosy-faced Lovebirds in the Phoenix area are sufficiently numerous and widespread that any control or eradication program would presumably be unsuccessful, and surely misguided. Indeed, to our knowledge lovebirds have shown little to no negative impact on native bird populations or habitats. Their colonial nesting habits and propensity to nest in palms in urban areas reduce any widespread competition for nest sites. Even widespread trimming of palms has had no appreciable effect on numbers, as birds readily move to adjacent areas to roost following local trimming, only to return to these same palms several months later. Lovebirds have also shown resilience to environmental conditions: Phoenix area lovebirds have survived temperatures ranging from -4˚C (January 2007) to 50˚C (June 1990). population. The typical lifespan in captivity of Rosy-faced Lovebird is 15 to 25 years. The typical lifespan in the wild is unknown but expected to be shorter than in captivity (De Grahl 1984), still giving each pair ample opportunity to replenish and expand populations. Furthermore, adult lovebirds appear to be fairly wary and swift on the wing, with few reports of their being caught by likely urban predators such as raptors or outdoor cats. Environmental conditions appear to favor a sustainable lovebird population, but psittacine beak and feather disease is always a looming threat. This viral disease affects all Psittacinae parrots and has the potential to become a major threat to all species of wild parrots and to modern aviculture, due to the increasing international legal and illegal bird trade (Wikipedia 2011). In view of the above and of the history of some exotic bird populations in the U.S. (e.g., Pranty 2001) the long-term status of the Rosy-faced Lovebird in Arizona is not predictable. However in the greater Phoenix area, they are widespread, their population is growing, and there is little doubt that this charismatic little psittacid will continue to be part of Arizona’s avifauna for the foreseeable future. Peyton, David Powell, Leslie Prophater, Cindy Radamaker, Kurt Radamaker, Mona Reese, Susan Rollins, Marion Saffell, Carol Shaw, Mary Shetter, Kathy Smith, Connie Squires, Mike Sredl, Brian Sutter, Karen Stucke, Karen Swoope, Dale Thayer, Diane Thrailkill, Walter Thurber, Marceline VandeWater, Magill Weber, Janet Witzeman, Robert Witzeman, and Daniela Yellan. Our apologies to any census participants we may have overlooked. Collar, N.J. 1997. Rosy-faced Lovebird. P. 410 in J. Del Hoyo, A. Elliott, and J. Sargatal, eds. Handbook of the Birds of the World, Vol. 4, Sandgrouse to Cuckoos, Lynx Edicions, Barcelona. Corman, T.E. 2005. Peach-faced Lovebird (Agapornis roseicollis). In Arizona Breeding Bird Atlas (T. Corman and C. Wise-Gervais, eds). Univ. of New Mexico Press, Albuquerque. De Grahl, W. 1984. The Parrot Family. New York: Arco Publishing, Inc.
Forshaw, J.M. 1977. Parrots of the World, 2nd edition. T.F.H. Publications, Neptune, New Jersey. Juniper, T. and M. Parr. 1998. Parrots: A Guide to Parrots of the World. Yale University Press, New Haven, Connecticut. Ndithia, H, M. R Perrin, and M. Waltert. 2007. Breeding biology and nest site characteristics of the Rosy-faced Lovebird Agapornis roseicollis in Namibia. Ostrich 78: 13–20. Pranty, B. and K.L. Garrett. 2003. The Parrot Fauna of the ABA Area: A Current Look. Birding 33:248-261. Pranty, B. 2001. The Budgerigar in Florida: rise and fall of an exotic psittacid. North American Birds 55:388-397. Simmons, R. E. 1997. Psittacidae: parrots, parakeet and lovebirds. Pp. 534-535 in J.A. Harrison, D.G. Allan, L.G. Underhill, M. Herremans, A.J. Tree, V. Parker, and C.J. Brown, C.J., eds. The Atlas of southern African birds. BirdLife South Africa, Johannesburg. Smith, P.W. and S.A. Smith. 1993. An exotic dilemma for birders: Canary-winged Parakeet. Birding 25:426-430. Vriends, M. M. 1984. Simon & Schuster’s Guide to Pet Birds. Simon & Schuster, Inc.: New York.